The South Carolina AHEC partnered with the U.S. National Library of Medicine (NLM) and three Lowcountry high schools for a health information literacy project. Students were charged with researching public health themes and creating educational comic books geared toward middle school students. In the process, the high school students learned about helpful resources from the NLM, gained valuable communication, research and creative skills, increased their knowledge about health careers and improved their health literacy. Students from the three schools worked to produce the four inaugural editions of AHEC Comics. Colleton County High School students and Lowcountry AHEC partnered to create “The Expert Investigators,” a book about the public health implications of an Ebola outbreak. Lowcountry Leadership Charter School students worked in a two-semester class to produce two books: “Prescription Strength,” a book about anabolic steroid abuse and “Choosing the Way,” a book about childhood obesity and healthy lifestyle choices. Finally, North Charleston High School students, in partnership with the Raise Up mentoring program, created “Coast in Crisis,” a book about earthquake preparedness and emergency response procedures. During the school year, the students attended workshops at the South Carolina AHEC Program Office where they learned valuable interviewing techniques and story writing skills, as well as tricks of the trade for good design and production. 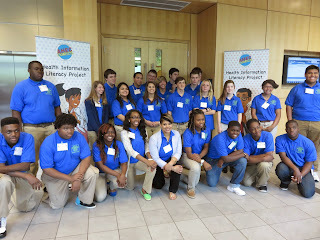 The students also became more proficient in determining the credibility of health information found on the Internet. Prior to the creating their storylines, the students interviewed healthcare professionals, public safety and emergency response personnel and other relevant experts to gather first-hand insight into their topic areas. In early April, two student representatives from each school along with two school liaisons and several members of the SC AHEC travelled to the National Library of Medicine in Washington , D.C. to present the project and share a sneak preview of a book with the NLM staff, including the NLM Director. Congratulations to the students on their hard work and excellent finished products! The South Carolina AHEC looks forward to the next two years of the project and the future adventures of AHEC Comics. For more information about the project, contact Dr. Deborah Stier Carson at carsonds@musc.edu.